Despite my title, which refers to the traditional Moroccan couscous from Fez, I often do not actually use the lucky seven vegetables and almost never serve this stew with meat. As with some of my salads, I rely on a cheap Kyocera mandoline blade as my workhorse for swift chopping of whatever vegetables I have on hand. The most bare-bones iteration of this couscous involves the couscous itself and the vegetable stew. If I am feeling like a fancy girl, I make the couscous with toasted almonds, chives, and currents, sometimes adding some homemade harissa and a pat of cultured butter (to imitate Moroccan “smen,” one of my next culinary projects). Also, if I am feeling fancy (read: not lazy or rushed), I will chop some of the vegetables with an actual knife for textural difference (especially if I am dealing with a Cinderella-size pumpkin). Let’s start with the couscous. If you are going barebones and vegan, all you need is the couscous (I like whole wheat), olive oil, salt, and water. (If not, you could also use chicken broth and/or cultured butter instead). Measure out equal portions of water and couscous. Boil the water, oil, and salt, add your couscous, turn off the heat, and cover for ten minutes before fluffing with a fork. Feeling big for your britches? 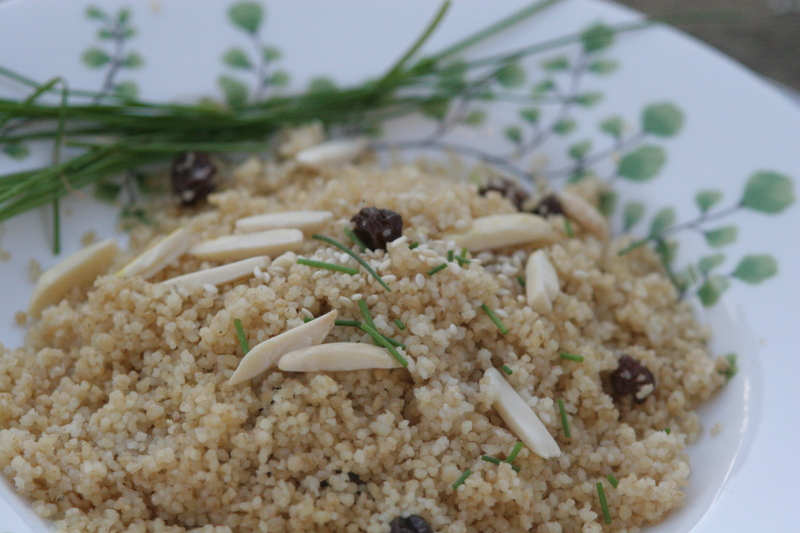 Toss a handful of either currants (just small raisins, really) or raisins in with the couscous before letting it sit. Meanwhile, toast some slivered almonds and/or sesame seeds, and snip a few chives to add before serving. For the stew you need a good base of alliums. I had red onion, spring onions from Mariquita Farm, and garlic so that’s what it was. Of course, shallots, green garlic, or any onion you have is just fine. Grab your mandoline blade and slice them up directly into a large frying pan with several tablespoons of olive oil. Fry on medium until they are translucent (circa 4 minutes since they are so thin) and slice up your other vegetables into the pot. I used purple and green kohlrabi, carrots, whole snap peas, and three canned Roma tomatoes which I just mashed with the back of a fork. Depending on the season, I may use turnips, pumpkin, parsnips, zucchini, fava beans, cabagge, bell peppers, or potatoes as well. This is mindblowingly flexible. Throw in a can of chickpeas and turn it all down low. If you want to be truly Moroccan about it, sweeten it up with a couple of prunes or dates too. Add a half cup of water and prepare your spices while the whole hot mess simmers for 7 or 8 minutes. You can include: toasted and crushed cumin seed, allspice, cinnamon, turmeric, ground or freshly grated ginger, and cayenne or Aleppo pepper (if you do not use harissa sauce when serving). I finish with a squeeze of lemon and then taste to see if the flavors are balanced to my liking. I also mentioned harissa. 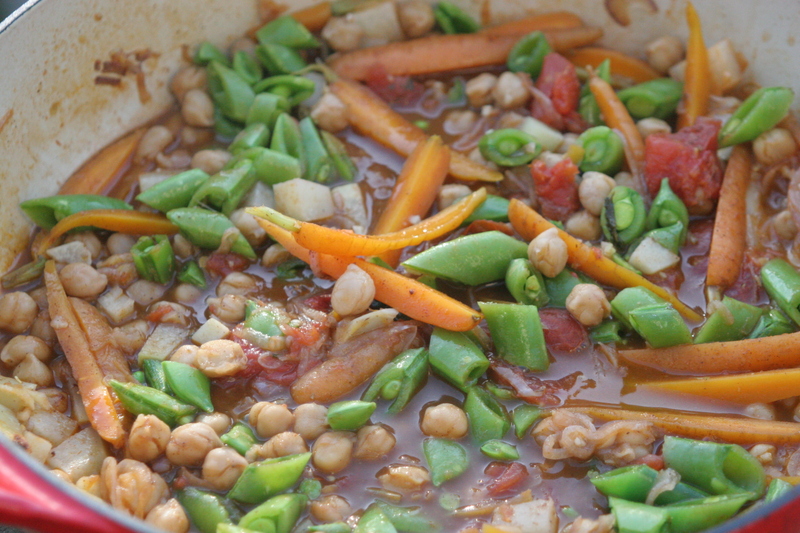 This is a spicy Moroccan paste that can be added in small or large quantities to each person’s dish. There are so many variations of how to make harissa, but at its simplest it includes mortar-and-pestled (or just whizzed in the blender) dried spicy chili peppers, garlic, oil, and salt. I made mine this time with olive oil, chili peppers I dried from last summer’s Mariquita farm padron peppers and ras al-hanout (a crazy mix of spices in itself, including rose petals). 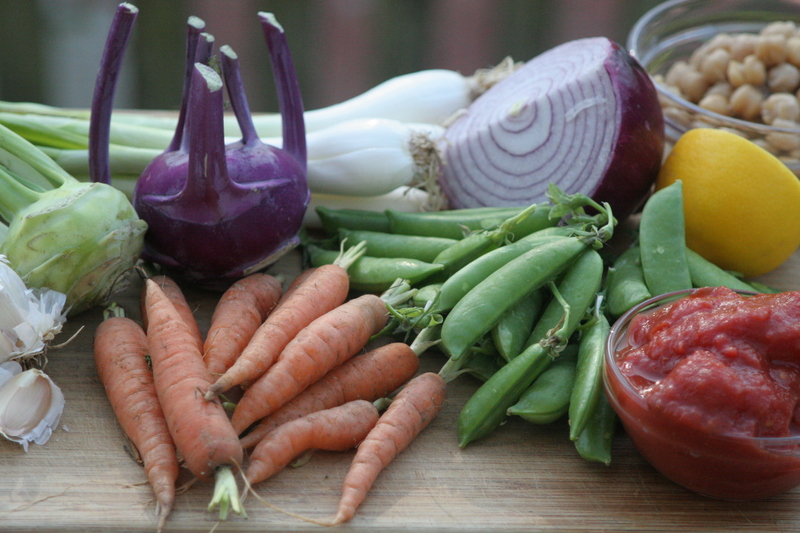 Choose from the following: carrots, peas, sugar snap peas, fava beans, any pumpkin or squash, zucchini, potatoes, turnips, parsnips, kohlrabi, cabbage, etc. Try for at least four, but up to seven, for Fez-style good luck. 1.Make the couscous. Boil the 1 1/2 cups water, salt, and butter or olive oil. Take off of the heat, stir in the couscous (and currants, if using), and cover with a lid for 10 minutes. Fluff with a fork, add a very drops of water, if too dry and cover for another 5 minutes). Add toasted almonds, sesame seeds, and ample snipped chives, if using, right before serving with the vegetables. 2. Meanwhile, heat the olive oil in a large frying pan to medium-high and saute the sliced onions (or shallots) and garlic for about 4 minutes until translucent. Stir once or twice. 4. Make your quick harissa, if using. Blend all the harissa ingredients together in either a blender, stick blender, or mortar and pestal. 5. 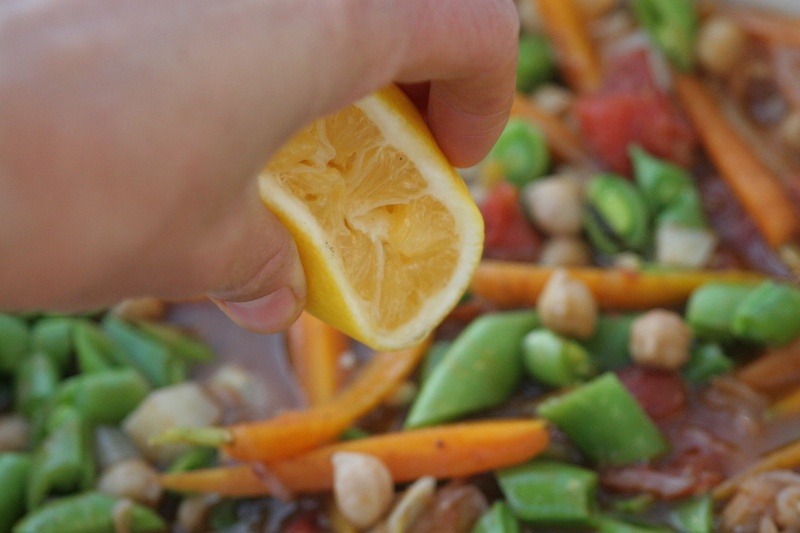 Squeeze the lemon into the vegetables, check the seasoning and adjust the salt. 6. Either serve individual plates with a bed of couscous, the vegetable stew, and some fresh cilantro and harissa on top, or serve Moroccan style in a huge platter. Everyone can choose how much cultured butter, harissa, or cilantro they would like on their couscous and vegetable stew. 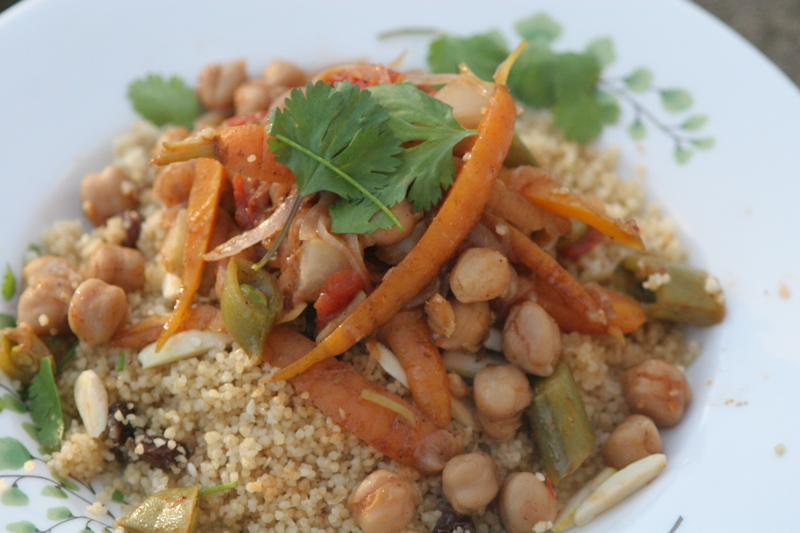 This entry was posted in Dinner, Inept-but-Earnest Cook's Night, Vegan, Whole Grains and tagged chickpea carrot couscous, currant chive almond couscous, Quick Moroccan couscous recipe, Seven Vegetable Couscous recipe, vegan couscous. Bookmark the permalink. So that’s the post I’ve been waiting for. You told me about mandolines a while ago, and I bought one that I couldn’t figure out how to use efficiently: as in, it took me way longer to use it than just chopping/grating the veggies. I’ll have to try another one. It all looks delicious, and I love the flexibility. My people have not appreciated Moroccan flavors in the past, but persistence is the mother of success. Your pictures definitely inspire. Thanks for letting me know. I am a novice with the coding behind all of this, but let me work on it again. I was able to add it to my google reader just now so try it again and let me know how it works. I just biffed couscous AGAIN last night, as I can never remember the proportions of couscous: water. Will definitely try the 1:1 ratio mentioned here. This might just revolutionize my dinner. So glad to hear it. Let me know how it goes. My kids protest when I add chives, but they love the nuts, currants, and lots of melted butter.